We’d love your help. Let us know what’s wrong with this preview of This is the End by J. Thorn. To ask other readers questions about This is the End, please sign up. This is a genre overflowing with books, new books published daily. This collection of 7 different zombie books and writers in one book piqued my interest and I decided to take a chance. Unfortunately, there is no summary available for any of the books in the package which caused me to start reading a title that I had absolutely no idea of what to expect. As it were, if the first couple chapters didn't grab my attention or interest I moved on to the next story in the collection. Some reviewers of This is a genre overflowing with books, new books published daily. This collection of 7 different zombie books and writers in one book piqued my interest and I decided to take a chance. Unfortunately, there is no summary available for any of the books in the package which caused me to start reading a title that I had absolutely no idea of what to expect. As it were, if the first couple chapters didn't grab my attention or interest I moved on to the next story in the collection. Some reviewers offered rave reviews to certain books and admit they had clumsy or slow starts...unfortunately, these were books that didn't grab me from the start and I never finished them. I did find four of the stories enjoyable: Affliction Z, Earthfall, Contamination Prequal and Slow Burn, which all deserve 4 and 5 star ratings. 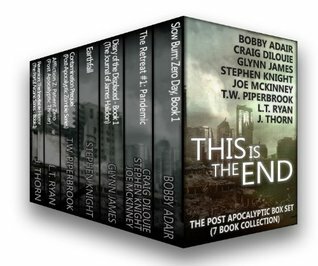 Their stories are much different from the majority of books in the genre...there is an apocalypse, of course, but the survivors and victims are much different The price of the entire collection is a pittance to what you might spend to purchase them individually - this book is guaranteed to keep your attention for several hours or more. A couple of those books I finished are book-one of a series - I do plan on adding them to my collection. Thank you for the opportunity to read through this collection. Highly recommended! "Sometimes, a half-bottle of breakfast tequila just isn't enough to deal with the day's reality." It was awesome. It was both seriously good and very funny, like Shaun of the Dead meets World War Z (with a little Outbreak thrown in). This is the story of your deadbeat stoner friend in the zompocalypse. I highly recommend it. Great ending, too, although I admit I was a little mad. Check it out. It was enjoyable but not great. I liked the idea, but the military writing was off. It was a mix of a little military knowledge and a lot of bad Viet Nam movies. That was amazing. The whole time I was wondering where the story would lead. There were so many possibilities that I couldn't be sure. Great storytelling and vivid descriptions made this a very good story. I think it might be the best story in this collection. The writing was very good, including descriptions of military operations and tactics (which is generally cheesy in most stories). The premise was good and the ending allowed the reader to picture the possible future without wrapping it up with a little bow. I thought I knew exactly where this story was going from the very beginning, but I thought wrong. I applaud the author on keeping the back-story back and not letting out to much from the beginning. I also give a big WTF for what was actually going on. The writing was really good, and the balance of suspense and horror kept the book moving along nicely. This is a great mixture of zombies, dark ops, and government conspiracy. It will leave you wondering whether the story was real or imagined, maybe even after you made your mind up. The stand-alone (Earthfall) was good and there were a few others I will continue with (Slow Burn, The Retreat, Diary of the Displaced, Contamination, and Affliction Z: Patient Zero, ). Well worth the price! Book 1 – Slow Burn: Zero Day. Great read. Easy to follow. virus is little different there are different types of infected. Zed and Murphy are slow Burns which they got lucky their between human/infected but act normal. Zed and Murphy was tossed after helping people out. And trying to stay alive and finding safely. I have no clue want to say about this infected virus totally different. I won't call them zombies but they are in way with eating and attacking Book 1 – Slow Burn: Zero Day. I have no clue want to say about this infected virus totally different. I won't call them zombies but they are in way with eating and attacking people. Also this gives military side of view and not the regular people (I guess they all turned in killer laughing clowns). They was all over the place who was leading or not. And you don't have to worry about liking or disliking characters because they dead new characters replace them. This one had little bit of everything not just zombie things. Had other creatures more of fantasy/sci-fi. I liked it. Had something new every page. All characters well done and plot of the story. No zombies which is great. Yes some humans are deformed for the war bomb's who didn't have a chance to seek shelter or had no where to hide. People underground needed some item's after earthquake. On the way they find out that they aren't the only one's. Bad thing's happen on their mission. The only thing that bugged me the most was that the both teams didn't move in at the same time or fall be hide just little. But fall back and sat waited way behind where something can happen to either teams where they can't help each other on team. We have someone trying to play god or jusStar'sn a mad man and also the follower in the group who are trying to teach the world a lesson. They started releasing virus in the food and water system that turn people into killers in a small town that we know of right now. Other then that it was great book. I really enjoyed this one. There is few things that needed more like air force PJ they very trained but in this story they was stomped all over or put down. Also about how some of the men from Tuck's team dead that was little unbelievable. I can see if they jumped up grabbed their leg they fell then zombie type thing got hold of their neck's. But other then that I loved the plot and where the story series going in the future. I'll wait on buying more until it's comes out in a book set that's how I like getting series. Loved this series and hated when they were all gone. Like most anthologies, the writing varies, or specifically my reaction varies. I think it's a great value and a way to easily discover other writers, and I did. Naturally all are first book of three or so, a way to get you wanting book two. Flynn James "Diary of the Displaced" is a good tale that starts slowly, but the entire series is available for 99 cents. I already own it and am reading the eighth book in James's "Arisen" series, highly recommended. The two discoveries here were L.T. Ryan's "Affliction Z, great story, I've already bought book two, and queued the third. I've had Bobby Adair's "Slow Burn" trilogy in my wish list, and now have to buy it, excellent first book. Bleck! The first two stories were good dystopian type stories that made me want to read more of those two. But then the rest of them are either sci-fi or people eating zombie type stories. I really don't like those so I skimmed the rest and put it down. Time to move on to another book. Interesting collection of post-apocalyptic ideas. Most of these books are not your usual post-apocalyptic tropes, and the few that do follow a more traditional zombie path deviate in unexpected and delightful ways. A balanced collection of novels and short stories, that has me eager to move on to the second Post-Apocalyptic Box Set. Sometimes these collections are extremely hit or miss, but I felt this one contained mostly hits. The books had some pretty interesting ideas and novel approaches to material that sometimes gets a little stale from over used of classic tropes. I only paid 99 cents, so it was definitely worth the asking price. It is always hard to give box sets a fair rating. As with most, this set had stories ranging from amazing and interesting to confusing and a bit slow. The styles vary enough that I would be willing to bet that most people would find something they enjoy inside. when I find out how I will delete it from my kindle my mind. I'm not a zombie apocalypse kinda person. It was pretty much gratuitous nastiness and sticky philosophy. Seven books! Most of these were pretty good, one or two were less than stellar, but since I picked it up for 99 cents, I am not unhappy. Had to take a break. Will get back soon. Loved having the first book of multiple series of similar genres. Kept me wanting more read it quickly. Well written, characters were visible to me , let me create their images in my mind. Jim finished Book 1 on 2-9, read the other six and finished on 2-16. He enjoyed the series and gave between 4.2 and 4.8 stars. I grew up in an Want a story that’s rooted in a fundamental aspect of being human? By the end of 2014, J. Thorn will have published over one million words and sold over 100,000 ebooks, worldwide. J. Thorn is a Top 100 Most Popular Author in Horror, Science Fiction, and Fantasy (Amazon Author Rank). In March of 2014 Thorn held the #5 position in Horror with his childhood idols Dean Koontz and Stephen King at #4 and #2 respectively. He is an official, active member of the Horror Writers Association and a member of the Great Lakes Association of Horror Writers. J. is a contributor to disinformation.com and a staff writer for HeavyPlanet.net as well as a founding board member of the Author Marketing Institute.